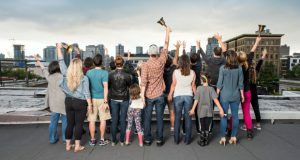 From fast food workers getting organised to fight for a living wage, to Uber drivers fighting a company infamous for its use of bogus self-employment models, to McDonalds’ workers in the US saying ‘No More’ to sexual harassment, a section of workers traditionally seen as “hard to organise” are proving their willingness to fight. Katia Hancke looks at what this trend represents. For those familiar with Naomi Klein’s “Shock Doctrine” the story sounds familiar. The economic crash and dramatic increase in unemployment was used to undermine working conditions and pay, and to force workers to accept precarious working arrangements and take-home pay well below the living wage. Services were out-sourced and agency work shot up. Since then unemployment has fallen significantly, profits are up, we hear no end of touting of an economic recovery by the establishment, but the reality is that working conditions are not improving, and that precarious work is a generalised reality for a new generation of workers. 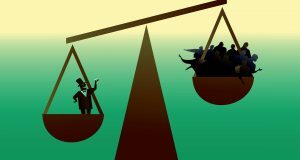 The economic crisis was used to force a race to the bottom in working conditions both in Ireland and internationally, while the 1% at the top accumulates wealth at unprecedented levels – wealth inequality is more extreme than ever before. The working class globally has grown massively in size. Between 1980 and 2005 the global workforce doubled, mainly spurred on by globalisation and the industrialisation of neo-colonial countries. India is a case in point. Despite very high levels of economic growth for the last 20 years, more than 80% of India’s workers scramble to earn a precarious living in the informal sector.2 The richest 1% of the population, meanwhile, cream off more than 70% of all wealth generated in the economy. This is what neo liberal capitalism has to offer to the working class today: casualisation and a relentless driving down of wages, while the very few at the top hoard obscene amounts of wealth. In Ireland, workers in the hospitality sector are most at risk of precarious working conditions, but education and health are also heavily affected. Workers in sectors in which informal employment has long been a scourge – such as construction – are more reliant on agency firms than ever. Stories of low pay, dangerous working conditions and breaches of health and safety abound. From crane operators to cleaners, to third level lecturers, precarity of employment is on the rise. The effects on workers’ lives are far reaching – not knowing what hours you will be working from week to week or sometimes from day to day does not just affect your work life and your social life. Precarious work means precarious income and that leads to precarious workers being at the sharp edge of the housing crisis, as they can’t access a mortgage and are stuck in overpriced rental accommodation or at home with their parents. People in precarious employment find it very difficult to plan their own future, leave alone plan starting a family. Precarity also makes workers more vulnerable to other forms of exploitation. A TUC study from 2016 into sexual harassment in the workplace highlights the link between the prevalence of sexual harassment for younger women and precarious forms of work, such as zero-hour contracts and agency work. The figures in the study are alarming: 63% of 18 to 24 year old women workers reported they had experienced sexual harassment; 69% of manufacturing workers and 67% of hospitality workers were directly affected. A study regarding the experiences of hospitality workers in the US produced similar results.4 There are no figures regarding workers’ experiences in the South of Ireland, as the SAVI report has not been produced since 2002 due to government cutbacks, but refusing to look into the problem doesn’t mean the issue is any less pressing. On the 1 November over 20,000 Google employees walked off the job in protest against the company’s handling of sexual harassment in the workplace. Their action drew attention across the globe and even the mainstream media were quick to link it to a growing anger of a new generation of workers in countries right across the globe. 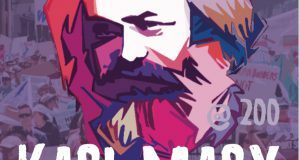 The enthusiastic response to the recent Google strike in Ireland is a first example of how these issues of oppression cannot be separated from the class struggle in general – in fact, they are now brought right back into the general need for workers to get organised on a class basis; and when they do so, social as well as economic demands are intertwined in their struggles. Any fight against sexism in the workplace is directly linked with the need to fight for secure employment, a living wage and strong trade union organisation. However, those over-represented in precarious work are under-represented in the trade union movement: young people, migrants, low-paid workers, people without a degree are less likely to be unionised than other sections of workers. Given all that, the recent developments of precarious workers internationally getting organised and taking militant action is all the more significant. Uber is a highly profitable company that forces their 70,000 drivers to work as bogus self-employed. This means Uber drivers are not entitled to basic workers’ rights such as holiday pay, sick pay and the minimum wage. Despite the tactics of the company, using their technology to divide and isolate their employees, drivers got organised and combined to take the company to court with militant strike action. At the start of November 500 precarious workers marched in London to highlight Uber’s Court of Appeal case. Uber workers marched from the Court to the University of London where outsourced workers are currently on strike and then on to show solidarity with NHS couriers who are fighting for a living wage. 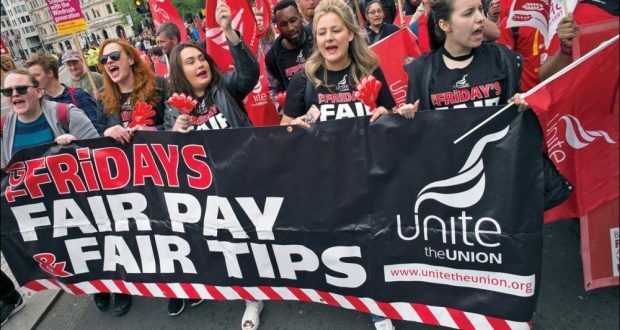 Recent strike action of hospitality workers – in McDonalds, TGI Fridays and other fast food chains – showed a similar level of solidarity and combativity. In the North, Unite have set up a new branch of hospitality workers on the back of struggle by Boojum workers against their employer. A new generation of workers are starting to move into action and are showing a willingness to take determined industrial action, including strike action, to force their employers to make concessions. The internationally co-ordinated strike action by Ryanair workers over the summer is another powerful example. Ryanair is a notorious union-busting company. The CEO, Michael O’Leary, has infamously stated that he would rather cut off his hand than deal with unions. The company, throughout its existence, has actively fought against workers getting organised. In the face of this, both cabin crew and pilots organised repeated days of strike action across six or seven countries. While the fight for union recognition in Ryanair is ongoing, the level of international solidarity displayed by workers traditionally not organised is impressive. The way in which this new generation of precarious workers is looking to get organised is still in an early phase and has found different expressions in different countries. Sometimes new unions have been set up from scratch. In some cases, the trade union movement realise their responsibility to organise these workers and put the resources in to unionise workplaces. But a lot more could and should be done. In the South, unions such as Mandate have tried to organise precarious workers, especially in the retail sector, and industrial action in workplaces such as Tesco, Dunnes and most recently Lloyds has not led to victories for workers. The months long campaign by Lloyds workers, for which they should be commended for the principled stance they took, is an example worth exploring. Lloyds is a pharmaceutical multinational with 17,000 workers across Europe and the US. In Ireland, they employ over 1,000 workers across nearly 100 stores. They routinely use banded hour contracts and low pay. Two hundred workers got organised, exasperated by the poor treatment by the company, joined a trade union and decided to take strike action. The company’s response was hardnosed – they locked out workers in some of the shops and point blank refused to engage with the union. The complications that precarious workers face, especially in the retail and hospitality sector, in taking on this type of employer are numerous. In order to be able to win such a dispute an immediate recruitment campaign to expand the strike and close as many shops as possible was essential. A quick escalation of industrial action, a broader trade union boycott of the company and international solidarity would have been other important aspects of a determined strategy to take on what was clearly going to be a hard battle. The trade union movement has a responsibility to do everything in its power to assist workers moving into industrial struggle for the first time against such a well-resourced enemy. Clearly, the growing anger amongst precarious workers about the impossible living conditions they are faced with will lead to further explosive actions. There is an interest in getting organised to win. But that involves more than just signing up to a union. It means workers organising their own workplaces, collectively deciding the key demands they want to win and what is the best strategy to win them. It involves building networks of solidarity across sectors and uniting workers around demands that will provide a tangible improvement to their lives. The $15 Now campaign across the US was one example of such a unifying demand, as it got to the heart of the poverty so many fast food workers experienced despite working long hours. For a new generation of workers, something has to give: they want to work to live, not just to exist. Under neo-liberal capitalism that means taking on the powerful interests of profit-hungry multinationals, getting organised is an essential first step in that process. The trade union movement could be transformed if this generation of radicalised workers becomes the beating heart of a re-energised trade unionism, reviving the legacy of Connolly and Larkin, based on militant action and working-class solidarity. In the United States, we have seen how a new generation, radicalised by the Occupy movement and the movement in support of Bernie Sanders in 2016, are moving to get organised in the trade union movement. 2017 saw a modest but significant increase in the numbers joining trade unions, 76% of whom were under the age of 35. This is a section of the working class that has displayed an openness towards socialist ideas and a rejection of the political and economic status quo.